If you’ve been following me for awhile, you might remember that a couple weeks ago I posted on Instagram and Facebook I had bought my first box of Jingles cookies this season. I love them. Well, I thought I loved them. They don’t taste the same as previous years. Seems like every year they lose a little bit of that “zip” that makes them special. …I decided to attempt it myself. Adapting my shortbread cookie recipe by adding in some nutmeg and anise extract, I think I came pretty close to the “old” original Jingles cookies. The ones with the zip! And, if you’ve never had Jingles, don’t worry about it. Just make these cookies and you will totally understand the love I have for them. 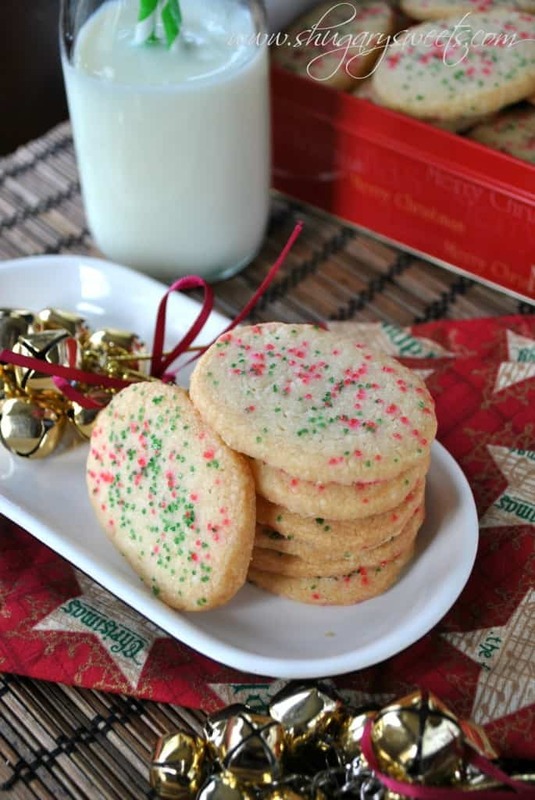 I’m sharing another shortbread cookie today too, over at In Katrina’s Kitchen. She is hosting a series called, “I’ll Bring the Cookies” that you better not miss! So many great recipes have been shared already…and some talented bakers yet to come! 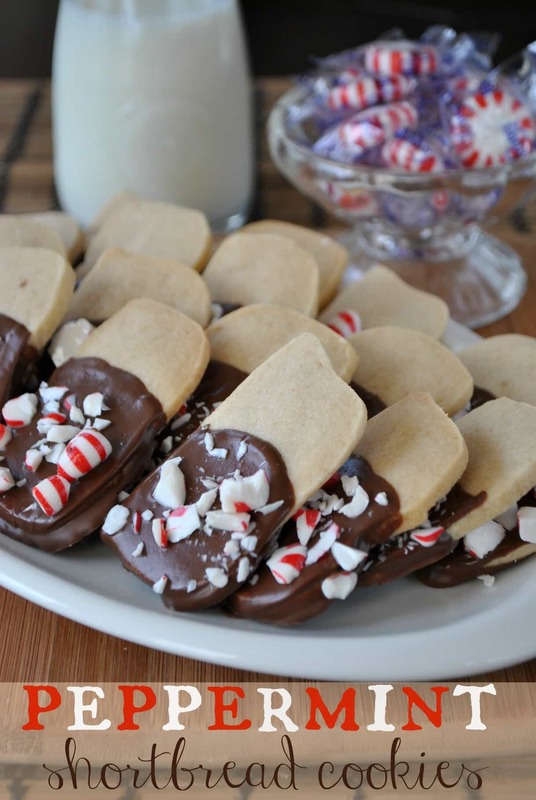 Today I shared my classic Shortbread Cookie, dipped in dark chocolate and peppermint! Perfect for the holidays! Be sure to head over and check it out! Or a classic recipe that’s been in the family for years? 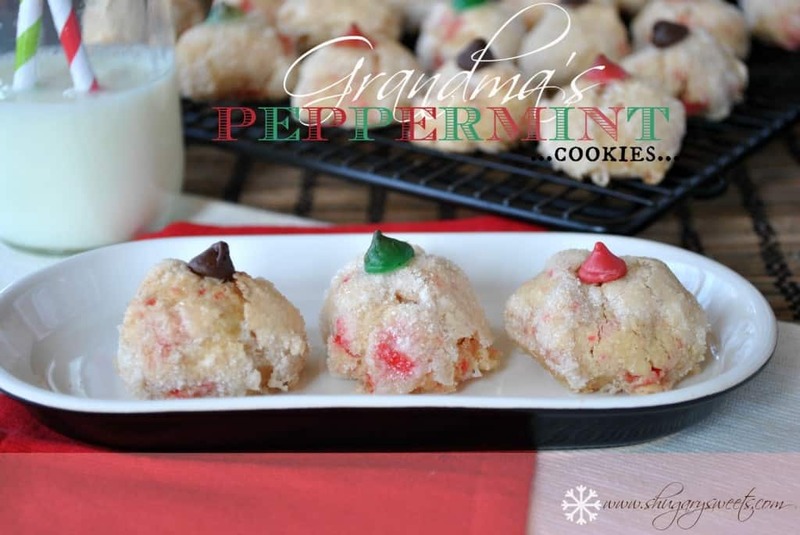 These Peppermint Puff Cookies have been around for a long time in our family, always making an appearance during the holidays! 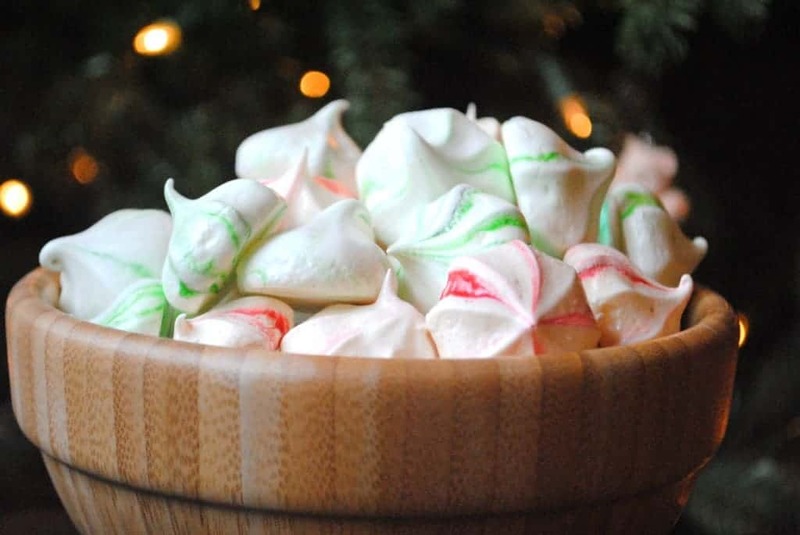 Minty Meringue Cookies– such a perfect little bite of a cookie. Light and minty! 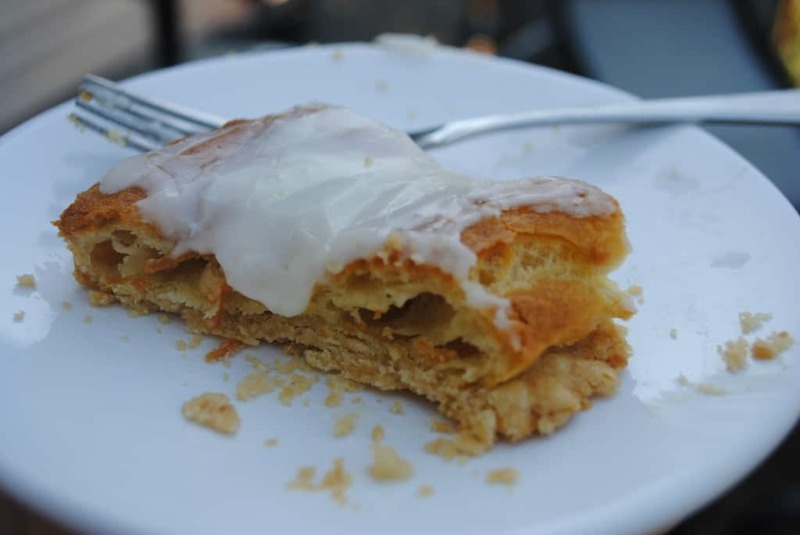 Almond Kringle– Grandma always bought these, and now I make them myself! In mixer, beat butter and powdered sugar until combined. Add in flour, salt, nutmeg and anise extract. Mixture will be crumbly, use hands to form a ball. Lay on saran wrap and roll into a log shape. Wrap up tightly and refrigerate for 30 minutes. Line a baking sheet with parchment paper. Cut slices of cookies 1/4 inch thick and lay on baking sheet. Sprinkle with red/green sugar. Bake in a 350 degree oven for 13-15 minutes. Cool completely and store in air tight container. ENJOY! I hope you find the extract!!! My grocery store carries it with all the other flavors, I hope yours does too! 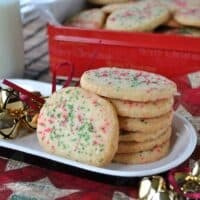 I’ve never tried Jingle Cookies but these look fabulous! I haven’t had the Jingles cookies but I do love a good shortbread cookie. It’s sad, many of my favorite “store bought” cookies just aren’t the same as they used to be. I’ll have to give these a try. 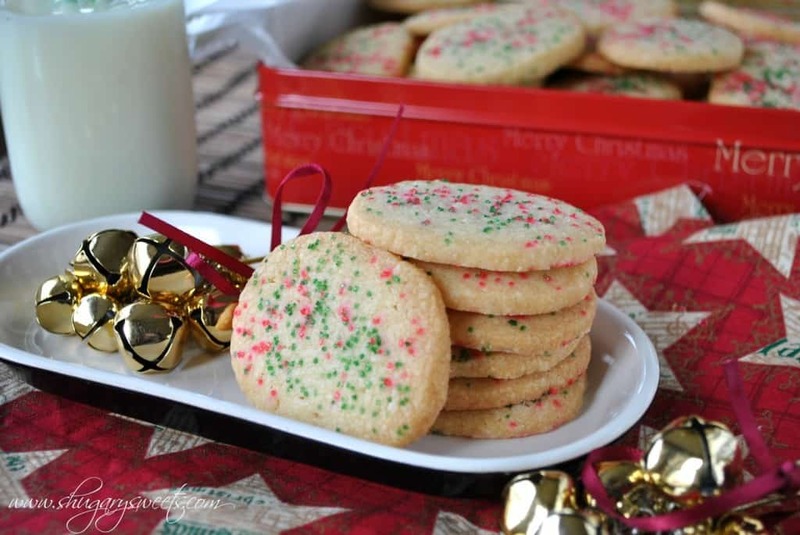 I bet these are much better than the original Jingle cookies! Definitely will need to try these soon! I don’t think I’ve ever had those Jingles cookies, but who cares about that store brand anyway? Your version looks WAY better! Yummy, Aimee! I used to love those Jingle Cookies too. But I don’t know if they’ve changed or my tastes have and they taste really processed and not very yummy. Can’t wait to try this recipe. Thank you for this Jingles recipe! I agree with you that the original Jingles seem to have gone by the wayside… Can’t wait to try your recipe! TFS! You are welcome!!! ENJOY! Let me know what you think if you try it, if I got it pretty close to the original. Blessings! Once we burn off our current supply of Christmas cookies, I’ll have to try this recipe. As a kid, I remember getting the BIG box of Jingles from (of all places) a butcher shop in Hamilton, OH. A box the size of “Party-sized potato chips” just packed full with Jingles. I always liked the ornament and bell shaped cookies the best, because they were the biggest! Not much better than a big glass of milk and a huge box of Jingles. They were so good, we never even thought of spreading peanut butter on them! Now THAT’s a good cookie! A giant box? That sounds heavenly!!! 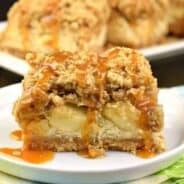 Thank you, thank you, thank you for posting this recipe! 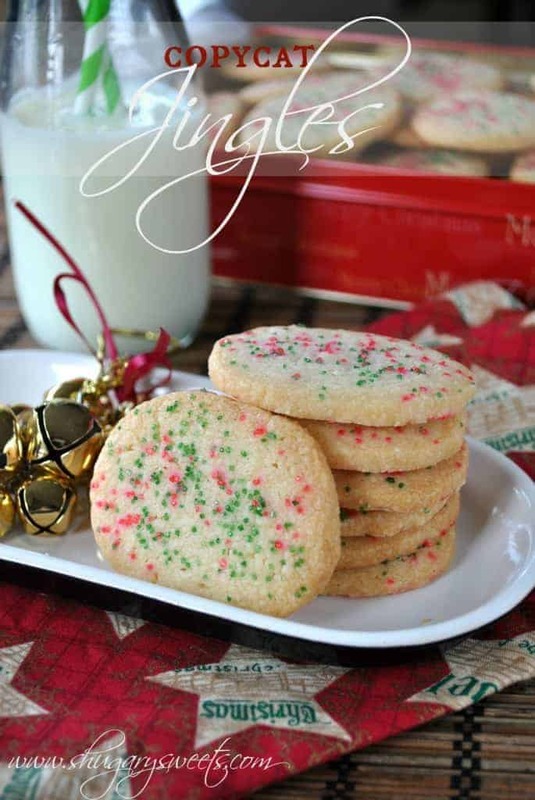 Jingles used to be my absolute favorite boxed holiday cookies, but over the pas few years, they have definitely changed the recipe to include less of the delicious anise flavor. I can’t wait to test these out this holiday season (or this weekend)! I never tried Keebler’s but I used to LOVE Salerno’s Jingles! I’m going to try this one and I hope it tastes like Salerno’s because I miss them. It was a holiday tradition to buy them each Christmas. Let me know what you think Kim! Loved Salerno Jingles!!!!! Can’t find them since we relocated to the south. Will do. I plan to make them this weekend. Thanks for the recipe. I am so excited!!!!! Pretty close to Salerno’s!! !Love them. I used my cookie press. Will definitely make again, I’ll add a bit more anise. Thanks again!!! So glad you enjoyed the cookie!! I thought I was the only one who missed the original Jingle Cookie! I loved the Anise flavor & the ones now days aren’t the same. Thanks for the recipe, I can’t wait to try it. sooo excited! ENjoy the recipe. My family LOVES these. And you can always adapt the amount of anise you use…more if you like them strong (I actually add a little extra to mine nowadays). I have been looking for Jingles cookies everywhere for the past 2 years because these are my absolute favorite cookies. 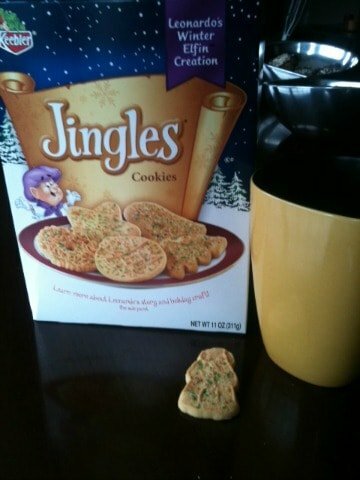 I could not find them anywhere & Christmas is not the same without Jingles cookies. I posted on Facebook asking for help to find these cookies but instead I found out that they have been discontinued. So in short, today i will learn to bake (I can but I just stink at it) and will make these cookies! Thank you so much! Um…where is the anise? For true Jingles you need anise. To be honest, as someone who grew up with Jingles.. This recipe doesnt taste like how I remember them. Jingles aren’t as buttery. But after a couple of these bad boys, I think they may be better. I’ll still be on the search for a Jingles duplicate though. Oh my goodness, I love jingles and have not seen them here in AZ. I love to dip them in hot tea! 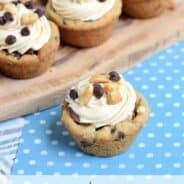 Will be making these for sure! Thank you so much for posting this! I love Jingles as a kid. One year I noticed that they didn’t have the same flavor not realizing the company had changed hands (blaming it on pregnancy taste buds!). Fortunately, I was in Rural King the other day buying spices and found anise extract (2 fl.) for under $1!!! (I love Rural King, as most spices and extracts are this inexpensive. I found your recipe and made MAGIC. I will use more anise extract in my next batch, but I really appreciate this great recipe. Have you tried them as a rolled out dough with cookie cutters? I just made this but my dough was not crumbly. I followed the directions so I don’t know what went wrong. My husband was appreciative of my effort to make his favorite cookies – thank you for that. It means Christmas too him. BHowever, he sheepishly smiled with a little sad lilt and said they were “close.” I looked at the ingredients on the Salreno box to compare ingredients – typical substitution of some part of the sugar with high fructose corn syrup, butter with oil that you see in commercial products. But they use soy lecithin and baking powder. How do you think either of these might affect your recipe? I am searching the internet for a picture of the original “Jingles” Box..no luck so far…has there been a consensus of former Jingles consoiers being appreciative of your attempt to duplicate Jingles…? Salerno made a version of these too called Santa’s Favorites. I’m so glad you reshared this recipe. My husband has wanted these cookies and we have hunted the stores for them with no luck. Now I can make them for him instead! Thank you!! These did NOT turn out for me. The mixture was incredibly crumbly. It didn’t hold its form putting it into a ball (rolling into a log was impossible) or even after 40 minutes in the fridge. I cut it, and it would immediately crumble. Tried cooking the broken bits, and the anise flavor is not what I remember of the Jingle cookies. Just not the recipe for me. Absolutely yummy! I had never heard of these cookies. I used this extra special anise extract I get from an Italian grocery. I had been looking for a recipe using this because it smells incredible. I am certainly enjoying these. Thanks so much for the recipe. 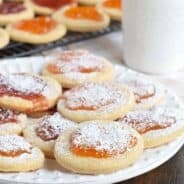 I’ve seen them in the stores but i’ve never tried them, being a baker I usually make cookies when I’m craving them so I can’t compare these to the store bought ones but you had me at nutmeg and Anise so I just HAD to try them. OMG these are delish! I Loved them! I can see where others might like more anise and i love anise and more wouldn’t be a bad thing but as is this cookie is perfect! I’m adding this recipe to my Christmas cookie rotation. Thank You! Trying out the recipe for the first time…hope they have that “Jingles” flavor. I eliminated the chilling, rolling and cutting steps by shaping the dough into balls and pressing each one flat with the bottom of a drinking glass. To keep the dough from sticking, dampen the bottom of the glass with a little water and dip it into granulated white sugar before pressing each ball. After pressing, decorate with the colored sugar before baking. This little hack saves time and you can press your cookies thinner than if you cut them.